We believe that each child deserves to have ideal oral health from the start. To achieve this, our doctors and staff are committed to creating an environment where your child not only feels comfortable and safe, but has fun as well. We want parents to feel that all their questions have been answered and feel comfortable with the treatment decisions they have decided upon after consultation with the doctor. It is important for parents to know that their child is receiving the highest quality care possible. After treatment is complete, our team will work with the child and the parent to optimize the child’s oral health for the future. We want families to feel our office is their child’s dental home. We want each child to feel safe and comfortable coming here, and look forward to coming to the office. 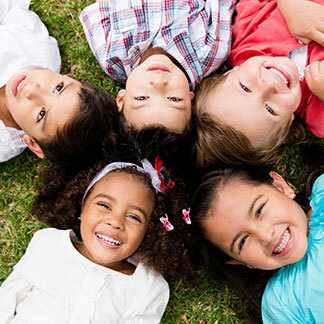 At Poiset and Associates, we provide complete dental care to any child with any condition. This can be healthy kids for twice a year checkups, early orthodontic care, children with emotional or physical disabilities, children with extreme amounts of decay, very nervous children, or children that have had the misfortune of having a bad experience at another dental office. We are able to bring any child back to a level of optimum dental health, and then work with the child and parent at regular checkups to ensure a beautiful smile and lifetime of healthy smiles. We take on cases that few other offices can handle, such as very young children or children with severe medical conditions who have rampant decay. We are able to see children who are medically compromised due to systemic illness and have experience working with special-needs children. In these cases, we coordinate closely with the child’s physicians, anesthesiologists, and the hospital to treat children that few other offices can treat. No one gets turned away because his or her treatment needs are too complicated. Poiset and Associates is able to provide a full range of anesthesia and sedation from light sedation and deep sedation provided by the dentists, to in-office anesthesia provided by an anesthesiologist from Rady Children’s Hospital, and anesthesia in the operating room at Rady Children’s Hospital. Our office is designed with an ocean theme. The colors are warm and bright, and there are many painted and mosaic tile murals that children love to look at. We also have a video game room that's so popular with the kids many come in early for their appointments, and often want to stay after their appointments to have more fun! We also have TVs above every chair for children to watch while receiving treatment. This is a major attraction and takes our patients’ attention away from the dental treatment they are receiving.